Once, Kodungallore Amma with the deities of Her own might, set cruising to different directions, and marked Purakkad, which was on top of its fame and prosperity at that time, as the meeting point for the journey back to Kodungallore. Due to reasons unknown, the present Deity of Murukkuveli temple could not reach Purakkad at the appointed time. 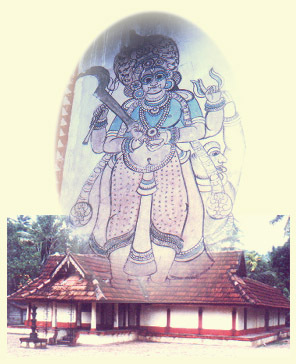 Kodungalloor Amma and the other Deities left Purakkad without Murukkuveli Devi. Having felt abandoned, Murukkuveli Devi decided to reside permanently in Purakkad. The Maharajah of Chempakasseri regime at that time perceived the celestial presence of this Deity in a dream. Traditions demanded to establish the facts of the Highness's dream by conducting Devaprasnam. Devaprasnam is a fact-finding technique by applying astrological calculations, omens, generalization and combinations of events. Only learned and experienced scholars of this science are entrusted to conduct Devaprasnam. Due to exigency of the dream, the Maharajah ordered his court astrologers to conduct an immediate session of the Devaprasnam. Having the presence of the divinity established and interpreted in the session, the Maharajah of Chempakasseri Regime ordered to construct a Temple for the Deity. The Maharajah granted large tax-free estates for the smooth performance of the holy rituals and to meet the allied daily requirements of the temple.